Chapter C7 More on potential energy functions Do problems C7.B2,B3, C7.S1 Due Monday. Printouts with all your grades to present are in your folder. Please. 1 Chapter C7 More on potential energy functions Do problems C7.B2,B3, C7.S1 Due Monday. Printouts with all your grades to present are in your folder. Please check them and report to me anything on the printout that is incorrect. 2 A note for lab. 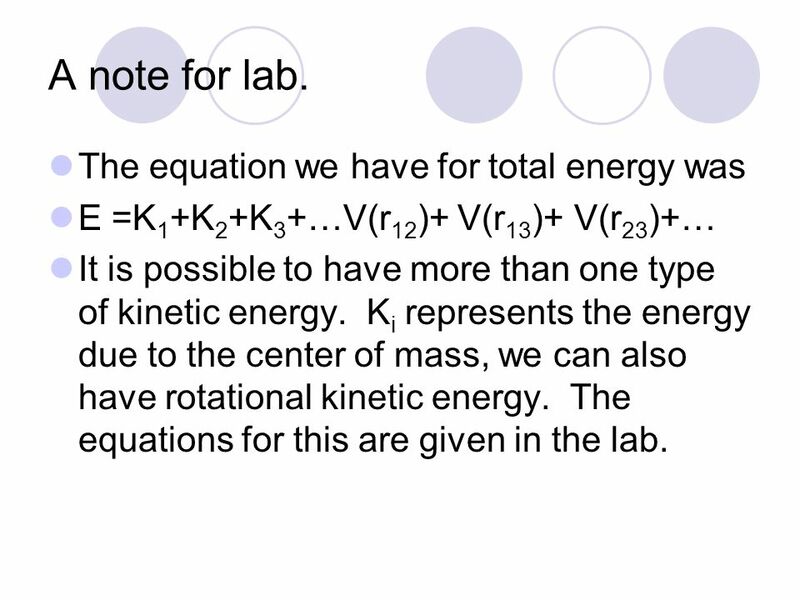 The equation we have for total energy was E =K 1 +K 2 +K 3 +…V(r 12 )+ V(r 13 )+ V(r 23 )+… It is possible to have more than one type of kinetic energy. K i represents the energy due to the center of mass, we can also have rotational kinetic energy. The equations for this are given in the lab. 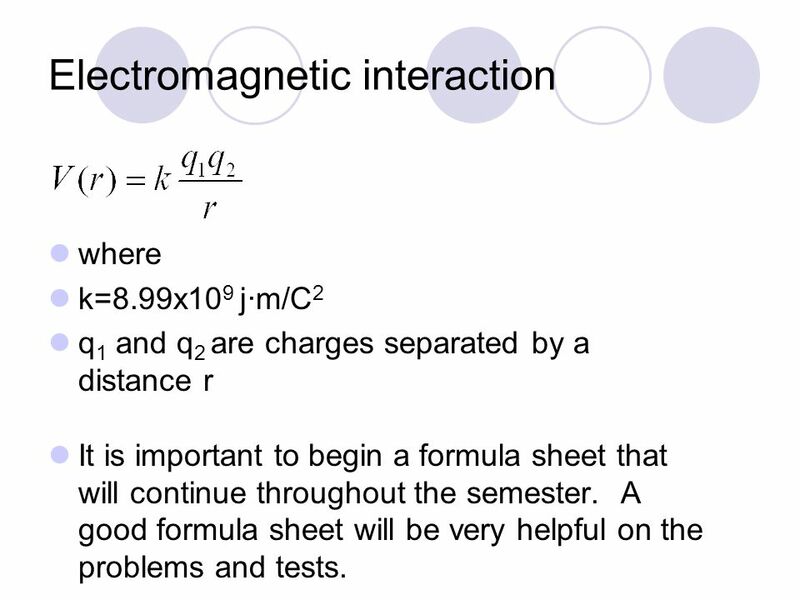 3 Electromagnetic interaction where k=8.99x10 9 j·m/C 2 q 1 and q 2 are charges separated by a distance r It is important to begin a formula sheet that will continue throughout the semester. A good formula sheet will be very helpful on the problems and tests. 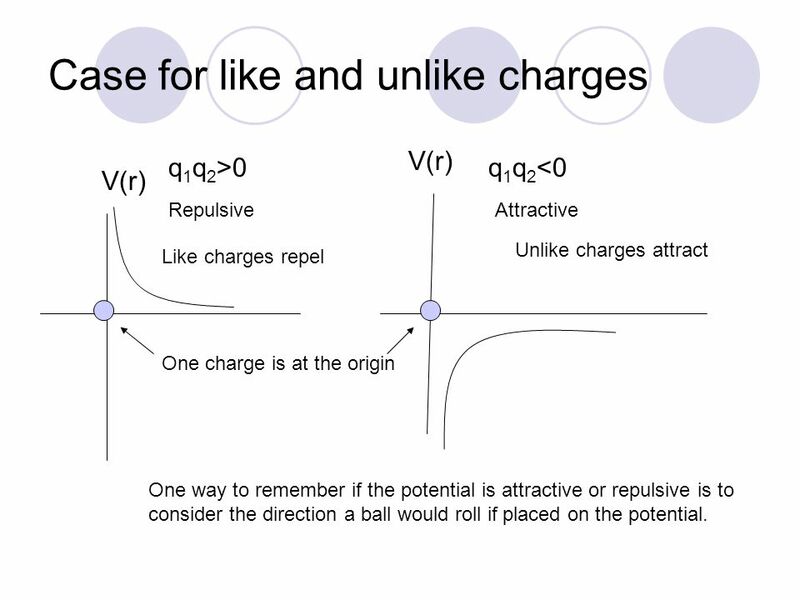 4 Case for like and unlike charges q 1 q 2 >0 V(r) q 1 q 2 <0 V(r) RepulsiveAttractive Like charges repel Unlike charges attract One charge is at the origin One way to remember if the potential is attractive or repulsive is to consider the direction a ball would roll if placed on the potential. 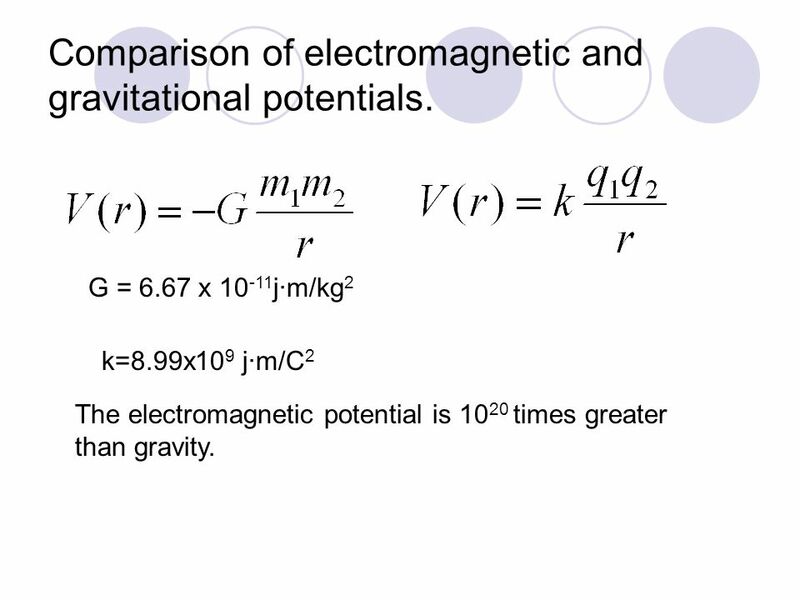 6 Comparison of electromagnetic and gravitational potentials. G = 6.67 x 10 -11 j·m/kg 2 k=8.99x10 9 j·m/C 2 The electromagnetic potential is 10 20 times greater than gravity. 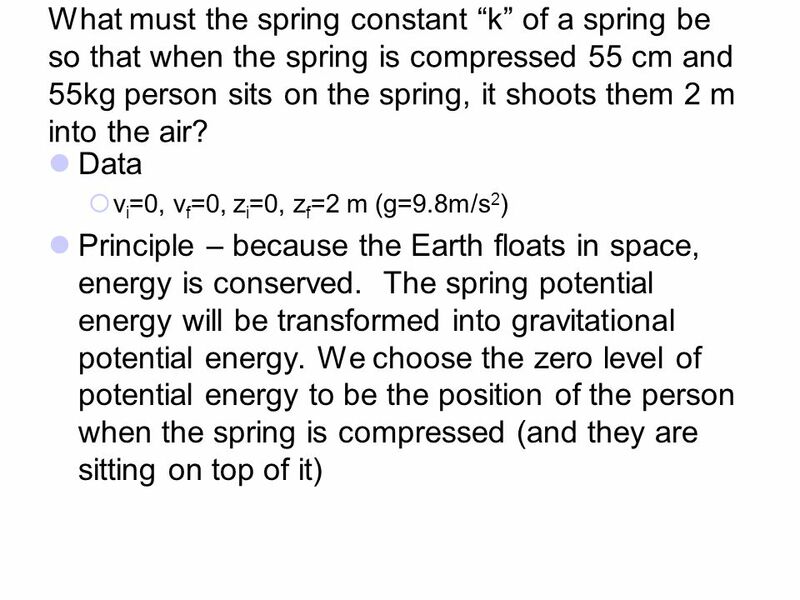 7 Potential energy of a spring V(x)=½ k s x 2 where x is the amount the spring is compressed or stretched k s is the spring constant, tells how hard it is to stretch the spring. 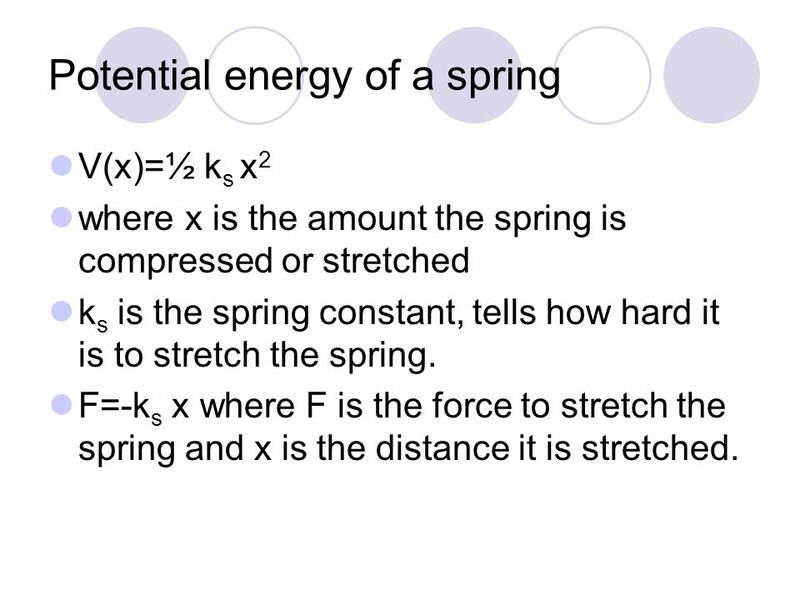 F=-k s x where F is the force to stretch the spring and x is the distance it is stretched. 11 Because the Earth is isolated in space, energy is conserved and we can write: Change in KE of rocket Change in KE of the Earth = 0 because the Earth is so massive. 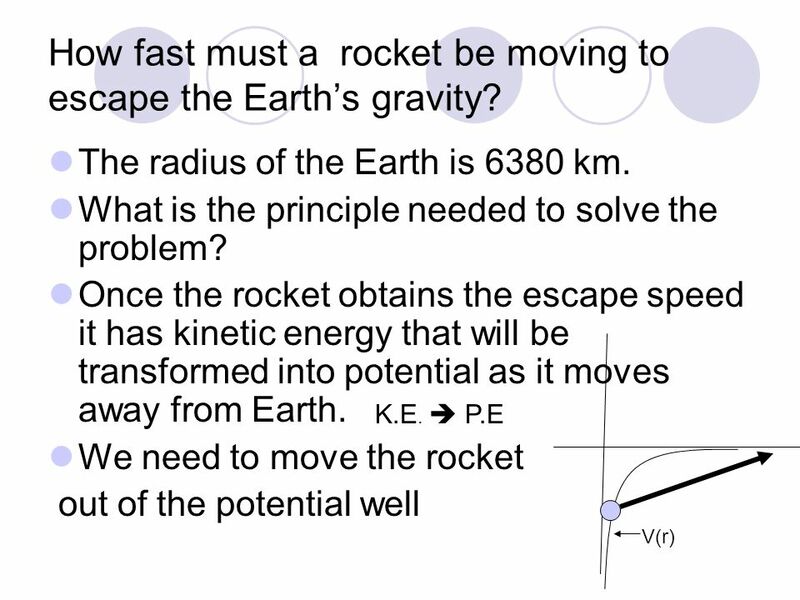 Potential energy r f →∞, v f →0 What is v i ? 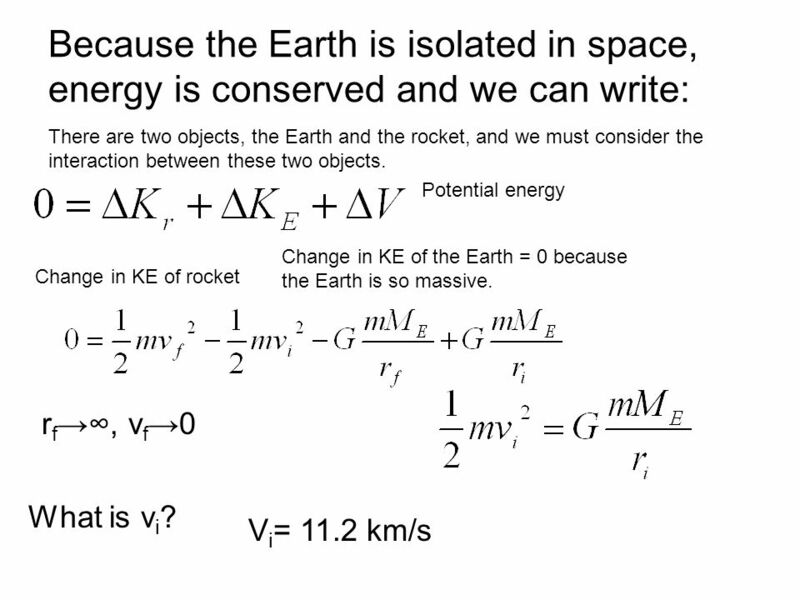 V i = 11.2 km/s There are two objects, the Earth and the rocket, and we must consider the interaction between these two objects. 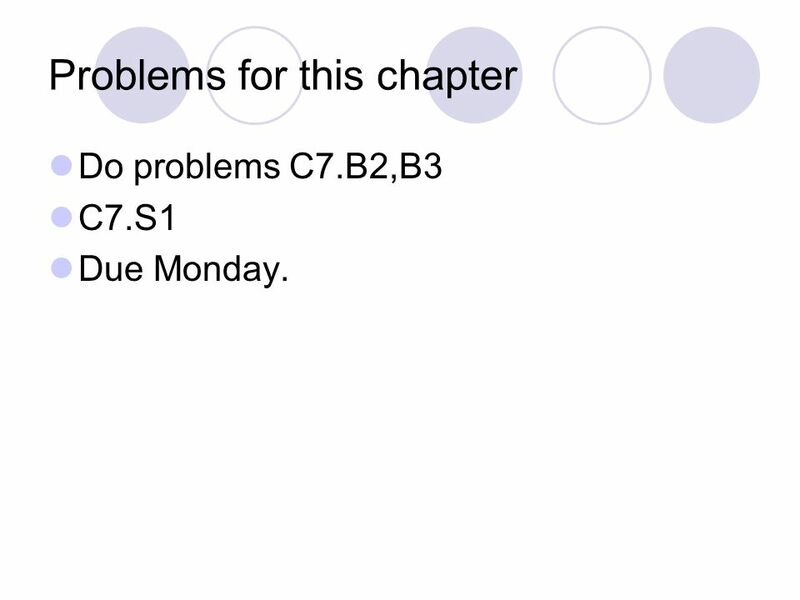 12 Problems for this chapter Do problems C7.B2,B3 C7.S1 Due Monday. 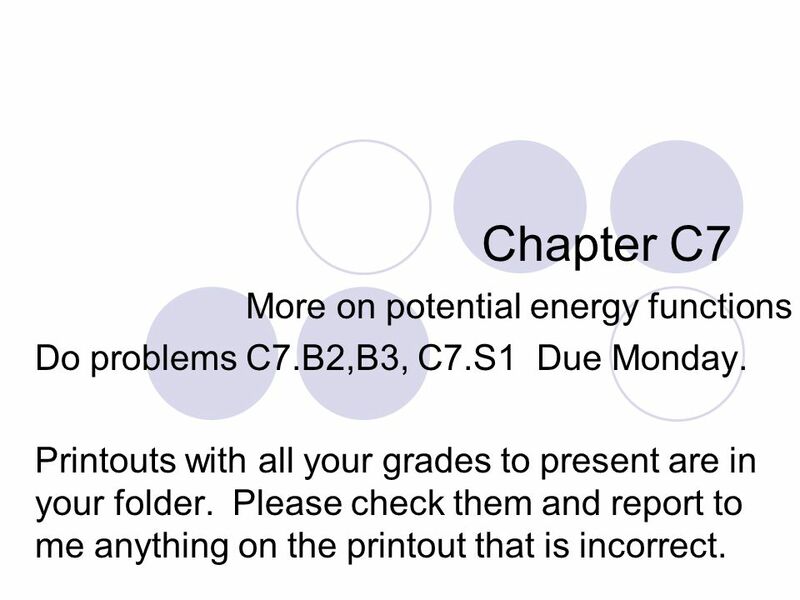 Download ppt "Chapter C7 More on potential energy functions Do problems C7.B2,B3, C7.S1 Due Monday. Printouts with all your grades to present are in your folder. Please." Quantitative Methods Interactions - getting more complex. Unit 7 Energy.  Energy is the ability to do work or cause change. I can work…but I won’t. Your tests and the printouts with all your scores are in the folder with your name on the front desk. Inform me of any errors on the printout. Assignment. 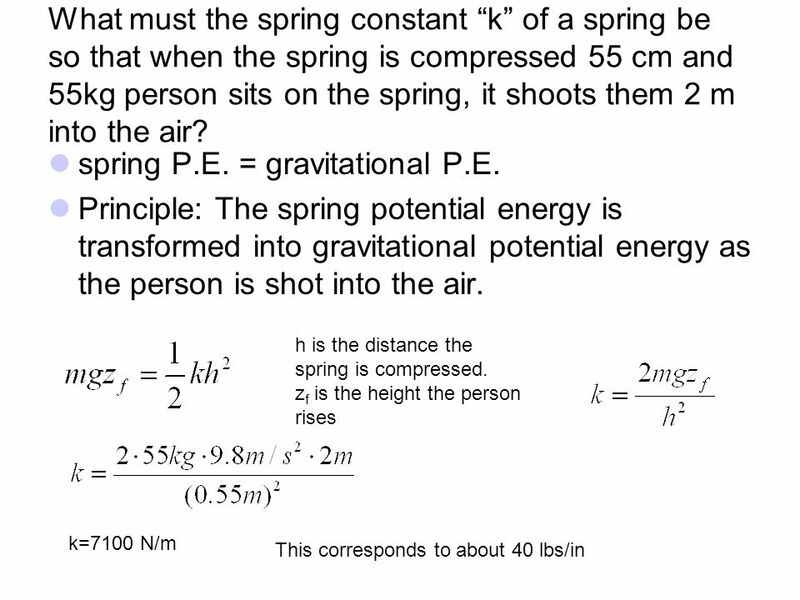 Electric Potential PH 203 Professor Lee Carkner Lecture 7. Chapter 10: Rotation. Rotational Variables Radian Measure Angular Displacement Angular Velocity Angular Acceleration. Mechanical Work: More Practice. 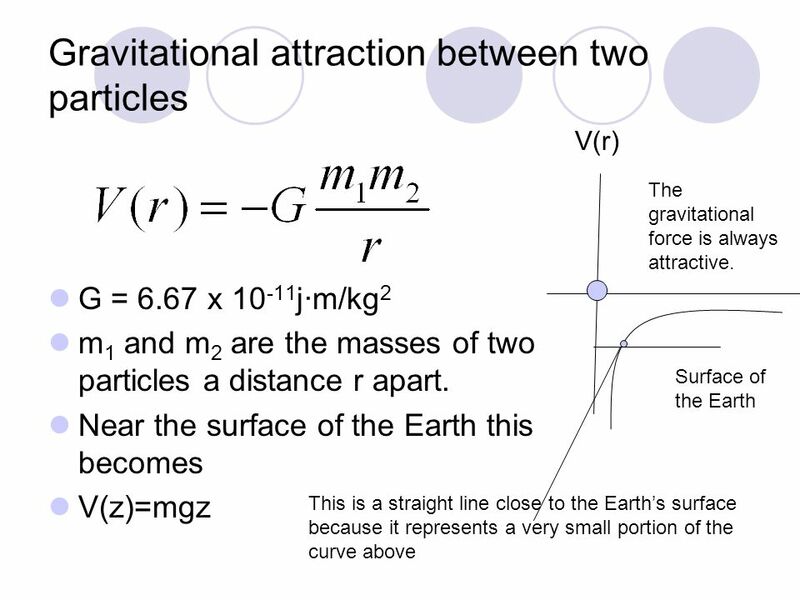 Gravitational Potential Energy: More Practice. 1. Energy Transformations Most forms of energy can be transformed into other forms. Energy transformation: a change from one form of energy to another. TP We will identify the relationships between objects and kinetic and potential energy by completing a lab P4L a skydiver releases 1,700,000 Joules of. Physics 2015: Rolling Motion and Moment of Inertia Purpose  Investigate which factors affect moments of inertia (such as length, mass, and shape).  Calculate. BASKETBALL MR. OLSEN 8 TH GRADE. How are mass and weight different? a. they both depend on the local gravity system b. mass depends on the weight and. FOPS W ARM -UP Make the following chart in your comp book and fill it 2 nd qtr; WEEK 7; Day 4. Kinetic Energy A moving object has energy because of its motion. This energy is called kinetic energy. Energy Notes 6 th Grade Science. Chapter 5 Section 1 What is energy? Review Class The entire period will be used to review gases and thermochemistry (text Chapters 6 and 7). The review will be most useful to students who.